The Senior Patroller program is a national continuing education program in which Patrollers can enhance their skills in managing emergency scenarios, toboggan handling and personal skiing. This course also prepares Patrollers for leadership positions within the NSP. The program consists of core and elective components relative to Alpine, and Nordic Patrollers. The program is administered at the Division level and recorded by NSP. To get started in the program contact your Patrol Director. Your Patrol Director can determine whether you are ready to enter the Senior Patroller program and if so, will then sign your application, which is found HERE. Your next step would be to decide whether to do Ski and Toboggan (S&T) or the OEC Module first, or to do both courses concurrently. Contact your Region Senior S&T and Senior OEC advisors, who will be able to explain how the programs are conducted in your Region, and advise you in your path through the program. Most Patrollers are able to complete the Senior OEC program in one year, while many find two years necessary to complete the S&T portion. Your success will depend on your present skill levels and your ability to train within each program. Both programs will provide you with ample opportunities to increase your skills and confidence in your patrolling career. There is no time limit on how long it may take you to complete the program. Many areas and patrols have incentives for becoming a Senior Patroller. They may include anything from shift priorities to financial benefits from area management. As a Senior Patroller the skills you obtain through this process will be a plus for your patrol and ski area. Varies by component. There is no time limit to complete the requirements. The Senior OEC Module focuses on leadership, problem management and decision making, utilizing the standards in the current OEC manual. SrOEC certification is a recognition of having successfully completed this leadership course and is not a higher standard of OEC skills. The skills learned promote confidence in dealing with more complicated first aid scenarios involving multiple injuries and patients. Training is done in the outdoor environment on snow, and involves participating in scenarios as a leader and helper. Instructors who are SrOEC Trainer Evaluators (TEs) develop the scenarios to cover all aspects of Outdoor Emergency Care, and provide feedback during training sessions. Candidates are required to successfully lead at least 4 scenario problems during the training sessions. Two scenarios from the Patroller's Manual need to be reviewed and have a treatment plan developed in writing. In addition the candidate is required to write an original scenario of Senior Patroller level, following the format in the NSP test banks. The SrOEC final evaluation is given at the conclusion of the course. It is conducted on snow and on typical mountain terrain. Candidates lead in one warm up scenario and two evaluation scenarios. Only the leader is evaluated in the scenarios. The NSP Board of Directors, the National Senior Committee, and division ski and toboggan advisors have developed a national-level ski & toboggan (Outdoor Emergency Transportation) training program that provides consistency, standardization, and quality in a supportive environment. The Senior Patroller ski & toboggan program has nationally established guidelines and requirements, to which neither division advisors nor regional ski & toboggan administrators can impose additional requirements. To provide a training and evaluation environment which encourages all Patrollers to participate. To expand and improve the NSP member’s patrolling knowledge and skills through a national program of training and evaluation. To provide NSP members with the opportunity to obtain quality upper level training. To improve the image of Patrollers and the National Ski Patrol. To provide a method for members to obtain personal improvement and achievement through definable goals. To prepare Patrollers for leadership positions in National Ski Patrol. Alpine Patrollers interested in becoming candidates in the Alpine Senior S&T/OET program begin completing an Eastern Division Senior Candidate Application (download application) signed by their Patrol Director who verifies that the applicant has sufficient knowledge, skills and experience to participate in senior level training. Patrollers may apply for participation in the Senior Patroller program at any time after becoming a NSP member, obtaining Patroller status, and obtaining their Patrol Director's recommendation. Skiing and toboggan handling skills should be proficient on “More & Most Difficult” terrain with bumps. Participation can be with alpine skis, telemark skis or snowboard. Applications for participation in the Regional Senior Patroller ski & toboggan program should be forwarded to the Regional Ski and Toboggan Administrator. Candidates then choose what training events they can attend which are listed on the SNY Calendar. Since the SNY Region has moved to a 1-day evaluation format, attending a Toboggan Enhancement Seminar and a Snowsports Enhancement Seminar are required prior to attending the Senior OET evaluation. The goal of these clinics is to provide instruction and feedback directly related to the skills assessed during the Senior Evaluation. If you plan on attending any of the S&T/OET training events, you must register through the on-line process AT LEAST ONE WEEK PRIOR to the event. There will be links on the SNY website to make this registration process a little easier. If you have to cancel for an event you have already registered for, please contact the person administering the event ASAP. As much as possible, throughout the season the Senior OET candidate’s progress is monitored and specific feedback regarding improvement is provided by OET Trainer/Evaluators (T/E’s) so that the candidate can qualify to take the Senior OET Final Evaluation at the end of the season. The Senior Patroller ski & toboggan program is broken down into three separate stations for clinic and evaluation purposes; they are skiing skills, Patroller skills and toboggan skills. For skiing skills the candidates are trained and evaluated on their ability to perform short, medium and long radius turns on varying terrain. For Patroller skills, candidates are trained and evaluated on their snowplow, sideslip and transition skills, as well as equipment carry and crud skiing. The toboggan skills station evaluates candidates’ skills at loaded toboggan, front and rear, and empty toboggan run. Clinics and evaluations will be held on Senior Patroller-rated hills with more to most difficult terrain. 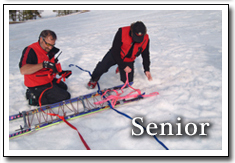 There is one primary format that the Regional ski & toboggan (OET) Trainer-Evaluators use to evaluate Senior Patroller candidates; it is the OET Senior Evaluation. This evaluation allows for feedback and some opportunities for improvement during the evaluation. Objectives of what is being evaluated along with demonstrations of the expected skills are provided by evaluators. While it is an evaluation, every effort is made by evaluators to reduce the stress of a testing environment. Standard or Level 1 Avalanche course or Level 1 Avalanche for Rescue Personnel course. The Nordic Ski and Toboggan (S&T) component includes Nordic Skiing, Toboggan Transport and Belays, and an Extended Nordic Ski Tour. These elements must be reviewed every three years to maintain Nordic Senior certification. Despite the multiple requirements, the tour/evaluation is low pressure and a lot of fun. Candidates work in teams on many of the required elements. The evaluation considers skill proficiency, leadership, adaptability, utilization of equipment, and confidence. Candidates should diligently train prior to the tour to build up endurance. Other required elements should be practiced as often as necessary to develop and maintain proficiency. Provides knowledge and skills to travel and work, in reasonable comfort and safety, in the outdoor environment. Field practice includes basic navigation, travel, survival and introduction to search and rescue. Students learn how terrain, weather, and snowpack contribute to avalanche hazards. Students become acquainted with human factors which skew effective decision making. The course also focuses heavily on fundamentals of self, group and organized rescue.